Two new Chandra images of supernova remnants reveal intricate structures left behind after massive stars exploded. Powerful winds of high-energy particles are released from the dense core of the dead star to create so-called pulsar wind nebulas. 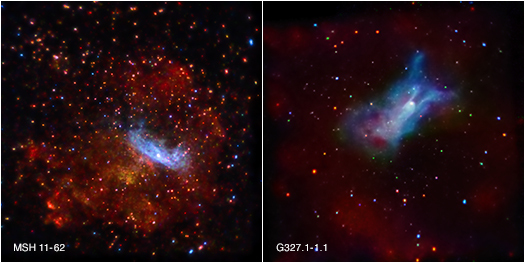 MSH 11-62 and G327.1-1.1 are examples of how complex the aftermath of stellar explosions can be. A supernova that signals the death of a massive star sends titanic shock waves rumbling through interstellar space. An ultra-dense neutron star is usually left behind, which is far from dead, as it spews out a blizzard of high-energy particles. Two new images from NASA’s Chandra X-ray Observatory provide fascinating views — including an enigmatic lobster-like feature — of the complex aftermath of a supernova. When a massive star runs out of fuel resulting in a supernova explosion, the central regions usually collapse to form a neutron star. The energy generated by the formation of the neutron star triggers a supernova. As the outward-moving shock wave sweeps up interstellar gas, a reverse shock wave is driven inward, heating the stellar ejecta. Meanwhile, the rapid rotation and intense magnetic field of the neutron star, a.k.a. a pulsar, combine to generate a powerful wind of high-energy particles. This so-called pulsar wind nebula can glow brightly in X-rays and radio waves. MSH 11-62 is located about 16,000 light years from Earth. The foreground of MSH 11-62 is speckled with hundreds of sources associated with the open stellar cluster Trumpler 18, located at a distance of about 5,000 light years, revealing a vast collection of stars. The supernova remnant G327.1-1.1, located about 29,000 light years from Earth, is another spectacular debris field left behind when a massive star exploded. The Chandra image of G327.1-1.1 (right image) shows the outward-moving, or forward, shock wave (seen as the faint red color), and a bright pulsar wind nebula (blue). The pulsar wind nebula appears to have been distorted by the combined action of the reverse shock wave, which may have flattened it, and by the motion of the pulsar, which created a comet, or lobster-like tail. An asymmetric supernova explosion may have given a recoil kick to the pulsar, causing it to move rapidly and drag the pulsar wind nebula along with it. Two structures resembling lobster claws protrude from near the head of the pulsar wind nebula. The origin of these features, which may be produced by the interaction of the pulsar wind with the reverse shock, is unknown. These results are presented at the “15 Years of Chandra” symposium (http://cxc.harvard.edu/symposium_2014/) by Patrick Slane of the Harvard-Smithsonian Center for Astrophysics, Cambridge, Mass., and Tea Temim of NASA’s Goddard Space Flight Center, Greenbelt, Md. The NASA Chandra photos look amazing! Thanks for this post are due to Manu Garcia at IAC.